What Does It Mean When a Guinea Pig Turns on Its Side? Your guinea pig may have a wide assortment of vocalizations, but the fact of the matter is, he cannot talk to you and explain when something's wrong. As a guinea pig owner, it's important you learn what behaviors are normal for your pet so you can identify any usual behaviors. Guinea pigs, like humans and most other animals, can choose to lie in a variety of positions depending on what each animal feels is comfortable. If your guinea pig rests on his side regularly but otherwise shows no signs of illness, then he's likely just choosing a position that feels good. When guinea pigs are relaxed and feel safe, they will stretch out and get comfortable. As long as he's eating, playing and happy, he's probably just fine. A guinea pig may lie on his side when he's sick. In this case, he may not want to move, and other symptoms of illness may be evident. 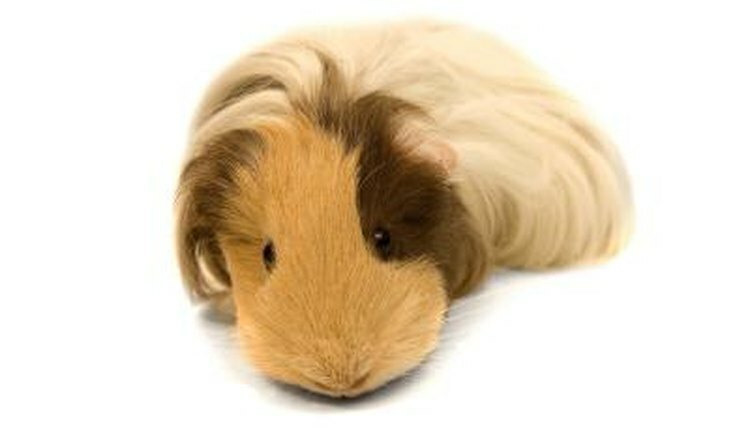 Signs of illness include lethargy, difficulty moving, heavy breathing, panting, runny nose, weepy eyes, diarrhea, vomiting or anything else that's not normal for your guinea pig. If your guinea pig is on his side and doesn't want to interact with you, is unwilling to get up or behaves in any way that's unusual for him, then you should call the veterinarian immediately. Guinea pigs can become overheated very quickly. You should never leave your guinea pig somewhere where he will be exposed to direct or even partial sunlight even for a short period of time. Guinea pigs can suffer heatstroke in less than an hour if temperatures are extreme. A guinea pig who is overheated may lie on his side and appear to be struggling for breath. He will be hot to your touch and may even feel floppy or limp. If you believe your guinea pig is overheated, you need to get him out of the sun immediately and rush him to the vet. Some guinea pigs will roll over and appear to play dead, normally lying on their backs, when they're very frightened. If something is distressing your guinea pig, such as another animal or a loud noise, and you see him roll over on his back, you should attempt to remove the frightening stimuli and wait for his behavior to return to normal. While you do not need to panic over every little thing, you need to pay attention to your pet on a daily basis so you notice the little problems before they turn into larger ones. If you've owned your guinea pig for several years and he has just started lying on his side, something about him may have changed that warrants a trip to the veterinarian. When in doubt about your pet's health, consult an expert.